Hotel InterContinental is nestled amidst beautiful parkland with well-kept plants and flowers adding to the beauty of the hotel. It is the most ideal choice for privacy and serenity on the seafront with a private beach just next to the marina away from the city rush with all the amenities of a five-star property. 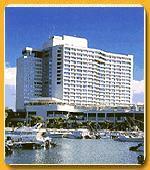 The Hotel InterContinental has 330 deluxe air-conditioned rooms. The rooms range from standard deluxe rooms to the luxurious royal suites.Each room opens either to the panoramic views of the Arabian Gulf or the city skyline with flowered garden in the foreground. Non-smoking rooms are also available. Facilities in the rooms include satellite color television, dual-line direct telephone, voice mail, modem and mini bar. The private attached bath has bathtubs, shower cubicles, bath amenities and bathrobes. Restaurants at the Hotel InterContinental are gourmet's delight. Keeping in tune with its cosmopolitan image, the hotel offers cosmopolitan cuisine. You can taste International, Mediterranean, Mexican, Lebanese and Thai cuisines in peaceful ambience and style. Hotel InterContinental presents the most luxurious conference facilities in Abu Dhabi. There are two marvelous ballrooms, a state-of-the-art auditorium and seven meeting rooms of various sizes, which you can select according to your own requirements. They can cater from a small gathering of 12 persons to a banquet of 1600 persons. There is also a private garden for much larger events where 2000 guests can be comfortably accommodated. To enhance your conferences, we also have comprehensive range of audio-visual equipments. At the business center, you will find fax, e-mail, personal computers, photocopier, secretarial assistance in English and Arabic, domestic and international couriers and conference rooms. Hotel InterContinental has a modern Health Club. You can shape-up your body any time of the day at our well-equipped gymnasium. Other facilities at the Hotel InterContinental include valet parking, airport transfer, 24-hour front desk, car rental, concierge desk, shopping arcade, round the clock room service, laundry service and currency exchange.